IBM® FileNet® Platform is a next-generation, unified enterprise foundation for the integrated IBM FileNet P8 products. It combines the enterprise content management with comprehensive business process management and compliance capabilities. IBM FileNet P8 addresses the most demanding compliance, content, and process management needs for your entire organization. It is a key element in creating an agile, adaptable enterprise content management (ECM) environment necessary to support a dynamic organization that must respond quickly to change. 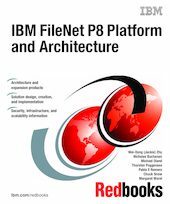 In this IBM Redbooks® publication, we provide an overview of IBM FileNet P8 and describe the core component architecture. We also introduce major expansion products that extend IBM FileNet P8 functionality in the areas of content ingestion, content accessing through connectors and federation, the application framework, and discovery and compliance. In this book, we discuss the anatomy of an ECM infrastructure, content event processing, content life cycle, and business processes. This book gives IT architects, IT specialists, and IT Technical Sales a solid understanding of IBM FileNet P8 Platform, its architecture, its functions and extensibility, and its unlimited capabilities.